At the start of World War II, the United States Army bought Paramount's motion picture studio at 35th Avenue and 35th Street in Astoria, Long Island City, Queens, New York, taking over in February 1942. The studio became the Signal Corps Photographic Center, later Army Pictorial Center, home to filmmakers and still photographers who covered the war and who produced countless training films. This is the story of the people who served there. The Army Pictorial Center website was able to contribute to some pre-Army film history. 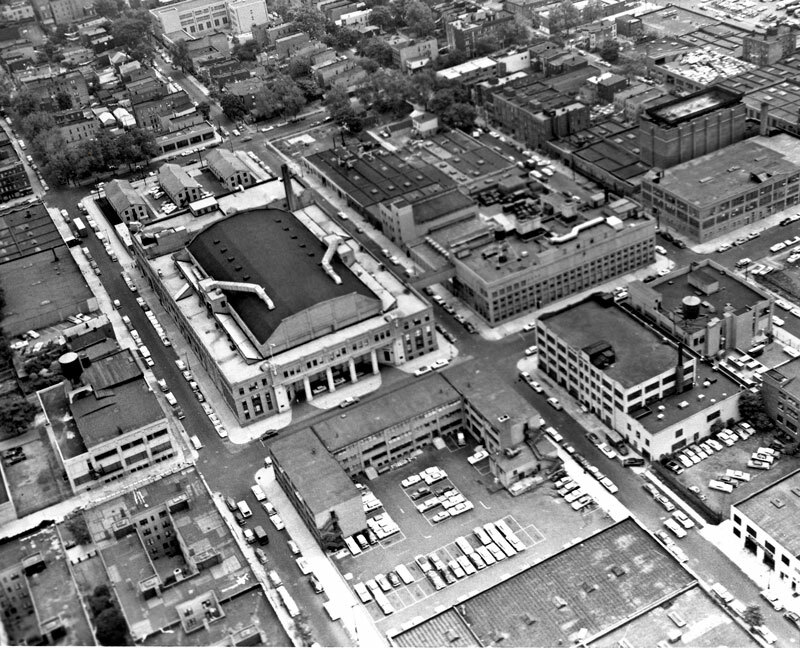 Using the aerial view of APC, above, author John Bengston was able to identify street locations used by Buster Keaton around the Astoria Studio in 1936. The picture of APC from the air was sent in by Ron Hutchinson (HUTCHINSON, RON, SP5, still photographer, assistant cameraman and projectionist, January 1961 to January 1963). Hutchinson also provided a number of APC photos from that time. Bengston is the author of a series of books about Charlie Chaplin, Buster Keaton, and Harold Lloyd, entitled Silent Traces, Silent Echoes, and Silent Visions, respectively. His books examine the historical settings preserved in the background of their classic films, and the changes wrought by the ensuing decades. Bengston was able to use the APC aerial shot to identify Keaton’s street locations. While not a part of the story of the Army Pictorial Center, Signal Corps still and motion picture photography was an important part of Army history and laid the foundation for establishing this important photographic center in Astoria, New York. With the advent of online services, many examples of Signal Corps work can be found. Among those is this topic. The Centennial of the 1919 Army Motor Train journey from the White House to Lincoln Park in San Francisco brought some early Signal Corps film work to the attention of Donald M. Scott. The convoy, to dedicate the Lincoln Highway, included a Signal Corps movie crew, who filmed highlights of much of the journey. Army Pictorial Center's monthly newsletter, In Focus, highlighted film production, history and daily life in Astoria. Eleanore (Mencik) Jettmar supplied a stack of In Focus copies from 1959 to 1964. Stories excerpted from In Focus will appear here, but for now, you can read the PDF files. Eleanore finished her service as secretary to the commander, and she filed away various documents like In Focus for future reference. The In Focus record fills in some details about APC. Twenty years! The end of March brings to a climax the salute from approximately 700 civilian employees and 300 military personnel to Army Pictorial Center as it goes into the 20th year of producing training and information films for troops around the world. It was 20 years ago that a small detachment of service men came from the Training Film Production Laboratory (TFPL) at Ft. Monmouth, New Jersey, to Astoria on 1 March to take possession of the old Paramount studios. Little did this small band of soldiers realize they not only were occupying buildings extremely rich in history of the fascinating world of entertainment but taking part in a venture that would be emblazoned in the annals of Army archives. But this wasn't the beginning of the move by Army technicians entering the business world of producing motion pictures. It started years before. During World War I, this branch of service made use of films in training through social hygiene pictures made by medical units. By 1918 nearly 100 reels of training films had been acquired by the Signal Corps before the Armistice was signed. Production slackened and finally ceased until 1928 when the Army again went into the motion picture field. Production was disrupted once more with the coming of that age of "talkies." After 1932 a steady schedule of training films was produced in the Signal Corps Photographic Laboratory at the War College in Washington, D. C.
This unit later moved to quarters at Ft. Monmouth. Then came the year 1940. Hundreds of thousands or men were being drafted into service. The film program expanded so that special arrangements had to be made for its housing. Paramount's Eastern Service Studios in Astoria came into the picture. After searching for adequate facilities, the Army closed its option on the purchase of the Paramount studios -- built at an estimated price or $10 million -- on 27 January 1942. Although possession of the studios was taken on 1 March, actual work on extensive alterations to permit the housing of troops and adaptation of the buildings to Army film production requirements wasn't begun until 22 March. WPA workers were brought in to help clean up the buildings. Department of Sanitation trucks from New York City were lined up outside the buildings in the mornings to carry away unwanted articles. On 8 May TFPL and the motion picture section of the photographic school moved from Ft. Monmouth to the studios to be known as the Signal Corps Photographic Center (SCPC). They were followed on 26 May by the school's still picture section. Colonel Melvin E. Gillette became the first Commanding Officer of the studios where only a few years before Walter Wanger reigned over his Paramount regime. This original band of officers and enlisted men witnessed a complete facelifting of the Paramount facilities which had stood in comparative idleness for quite some time after the company moved its headquarters to Hollywood. This progress was also seen by 60 civilians still working at the Center who came here in 1942. Studios previously used to produce such firsts as a big feature musical -- "Coconuts" starring the Marx Brothers – and a full-length sound picture -- "The Letter" with Jeanne Eagles – changed appearances for Army purposes. The areas where the Post Exchange and TV Maintenance are now located were made into living quarters Ior the servicemen. The wooden buildings behind the present cafeteria were constructed for barracks (original plans for a four story brick building were discarded). Military personnel were also housed in hotels throughout the city. The orderly room was located where TV studio's control room is now. The present post cafeteria was then a mess hall. A troop recreation area was installed in the spaces now occupied by TV Operations and Intelligence Office. Dressing rooms previously used by such famous personalities as Walter Huston, Maurice Chevalier, Billy Burke, Gertrude Lawrence, Char les Ruggles, Rudolf Valentino, Eddie Cantor, Ed Wynn, Tallulah Bankhead, Preston Foster, Richard Dix, William Powell, Gloria Swanson, Frederick March, Gary Cooper, Claudette Colbert, Ginger Rogers, Lionel Barrymore and many more were converted into working areas for the deluge of employees to come. The acquisition from Paramount included just the studio areas located in Buildings One and Two. Other buildings were later leased or purchased as the demand for them grew. Building 13 was used by a civilian firm as an aeronautical school to teach Air Force recruits before being purchased for use by the Center. The photography school was conducted a few blocks away on Broadway. An obstacle course was built elsewhere in Long Island City to train cameramen for combat duties. Animation was housed in Manhattan on the top floors of a 13-story building at 32nd Street close to Lexington Avenue. Film was stored in a building on Crescent Street in Astoria. The smaller buildings on 35th Street opposite the rear gate of Buildings One and Two were leased to house the Motor Pool until the APO building at 48th Street and Northern Boulevard was made available by the Army. The present barracks in Building 24 were constructed by Army engineers in 1953. Before that time the space had been used as a parking lot. There are 12 men employed here today who came to the Center in 1942 as military personnel. They tell of the times when they had to fallout in the mornings for reveille on 36th Street—also for inspections and drill. They remember marching up and down this street early in the morning shouting cadence. On days when weather was bad such drills would be held on the main stage. Autograph hounds would line up outside the rear gate during the early years of the Center hoping for a chance to see their favorite movie idols who were stationed here as service men. Many Hollywood personalities, including actors, technicians and directors were at SCPC in 1942 and 1943. Formal dedication ceremonies of the Center were held 22 September 1942, with such dignitaries as New York City's Mayor F. H. La Guardia and Major General Dawson Olmstead, Chief Signal Officer on hand with Col. Gillette for speeches. The occasion, with liberal coverage by the nation's press, was described as not only being "an important one for the military services, but it was a historical occasion for the cinema industry, recognizing, as it did, the part that visual education plays in our modern, mechanized streamlined Army." The ceremonies were broadcast by radio station WJZ~ the Blue Network's 50,000 -watt outlet in New York, and picked up by 140 stations on a coast-to-coast hook-up. SCPC had a two-fold mission during the war: To produce training and educational films which would help to teach men soldiering quickly and to teach photographers the art of making combat pictures. Personnel reached an approximate strength of 3,000 during the war. With today's personnel force around one-third the size it was then, a year's production program and the selection of film subjects is not a hit-or-miss affair, but a well-considered, well-planned decision based on the training needs of the Army's various agencies, weighed and evaluated in reference to the needs of the entire Army. After the final decision has been made, scripts are written, casting done, stages set, and film shot, developed, edited and synchronized with sound. The job couldn't be called completed until distribution of these training and information films is made through a network of film libraries throughout the world. The Army has been rewarded not only by speeding up training of its soldiers but has been honored by numerous organizations for films produced at the Center .
. Among the top honors were three "Oscars" awarded by the Academy of Motion Picture Arts and Sciences. “Seeds of Destiny" in 1946 and "Towards Independence" in 1948 were termed as the most outstanding documentary short subjects . "Prelude To War" in 1942 also won an "Oscar" for its "outstanding achievement. The film "Operation Blue Jay" was nominated for another "Oscar" in 1953 as the best documentary short subject. Among other honors are these top awards: The U. S. Camera Achievement Award in 1942 in recognition of outstanding achievement in photography; National Headliner's Club Award for "best newsreel reporting” in 1944; National Committee on Films for Safety accorded highest honors in the general safety field for non-theatrical films produced or released in 1950 for "Once Too Often" and again in 1953 for "On Post Safety”; Venice International Exhibition of Cinematographic Art first prize for natural science film "Rodent Control" in 1951 and "Schistosomiasis" in 1948; Freedom's' Foundation Award for the film "Voices of the People" in 1949, "Communism" in 1950 and "International Communism" in 1953. Talents and professional skills of Hollywood celebrities stationed at SCPC as military personnel during its early years were put to good use in many of the films produced here. Among these personalities were William Saroyan, John Huston, Frank Capra, William Holden, Carl Laemm1e, Jr., Jesse Lasky, Jr., and Harry Warner, Jr.
Another important phase of production at the Center is the work done by Television Division. Although a comparatively new-comer to the Army, television has left a definite mark. Television came to the Center on 13 July 1951, with the assignment here of a mobile TV unit. This was detached to Fort Monmouth until adequate facilities and manpower could be attained. Originally this unit was equipped with four bus-type vans. After a few trips to the field, the vans were termed impractical and were converted to tractor-trailers in 1953. Kinescope recording equipment was authorized shortly thereafter when Washington was convinced that such facilities would be advantageous in that filmed programs could be shown over and over again. This new equipment was anything but idle in its infancy at the Center. Personnel would hardly get a chance to take a quick look at the installation before they would leave with the field unit once more. During this time television was proving to military leaders its significance to the Army. Perhaps the year 1954 was the one of greatest expansion for the TV Division. Other mobile units were added and a complete, modern studio was installed where the troops slept before Building 24 was constructed. During 1954 both CBS and NBC television networks used the facilities, equipment and personnel in the studios here for coast-to-coast hook-ups. One of these shows won NBC and the Army Signal Corps the coveted "Peabody Award" for its presentation. In 1956 the first television cameraman's class was started. This successful course was conducted for two years and discontinued because it was felt the supply of cameramen was sufficient. Through the years TV cameras manned by Center crews have been trained on many important events, including: parachute jumps of tactical exercises with a portable camera; launching of missiles; Armed Forces Day celebrations; national defense exercises; and the presidential inauguration ceremonies of both Dwight D. Eisenhower in 1957 and John F. Kennedy in 1961. Another first in the Army was achieved in November 1958 when APC received a mobile color television unit—among the first in the entire TV industry. History repeated itself again in the month of the Center's 20th anniversary when yet another color van was delivered. Advancement continues today in the TV studios and field units as more and more technical knowledge in telecasting is continually strived for. A history of the Center couldn't be complete without the mention of another new phase of pictorial science—photo instrumentation. Such a mission was assigned to APC in 1959. Photo instrumentation involves the application of photography to scientific or engineering purposes. It is the recording on photographic film and other light or radiation sensitive materials of phenomena under scientific observation, which later can be analyzed and measured. This division of the all-important work day after day here also continues to be analyzed and the stress is on constant improvement of services. Indeed, as history was once made here by commercial film makers, it will continue to be made by the Army as production continues at a high rate of speed. There are approximately 300 to 350 projects in some phase of production per fiscal year with over 600 reels completed a year and film processed at the rate of four to five million feet per month. Headlines, stories and photos that previously appeared on this home page may have moved to Yesterday's Headlines, where you can still find helpful links. Yes, we still need your help to answer the questions about SCPC/APC and films made there. Stan Noble, formerly with the TV Production Branch, is sought by Neil Upchurch. Information about "Get Set Go" and kinescope distribution was provided by Neil Upchurch. CW2 (Ret.) Dave Brouchoud seeks film or photos of the presentation of the All Army Flag to Ft. Monmouth in the late 1950s. Edward K. Samson III wonders what time bed check was for enlisted personnel in France in 1962/1963. T/SGT B. J. Reisler is the subject of a charming romantic mystery. An Italian lady wonders about the mystery photographer who wrote words of affection to her mother in 1946. Lost images from the ETO -- the kind saved by photographers but that didn't make it into the National Archives -- are needed for a book. 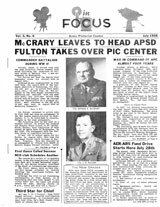 What kind of black-and-white film would Army photographers have used during the 1950s? Russell Hay posed that interesting technical still-photo question. Did Glenn Miller bring his famous Army Air Force band to the Astoria stages? We'd like to know! Film producer Christine Fitzpatrick needs footage for Korea War Battle of Ch'ongch'on River and Battle of Chipyong-ni, and also the Vietnam War Battle of Ap Bac (1963). What was that artillery film made in Ft. Hood about 1965? James (Jim) Strizich, of the Artillery, 2nd Armor Division, appeared as a lieutenant. Is that Truman Bradley showing us how to select and pack an animal in 1943 training films? A WWII re-enactor seeks information about Signal Corps Field Caption Cards. "It is quite rare and information is scarce." Someone has acquired a WWII Oneida Photographic Lab Trailer and is seeking information, manuals, or photos. It isn't an SCPC connection, but an Army photograph led Lisa R. Gerardi here in her search for records made by her grandfather, PFC Bernie Rattet. Who was Jerry, the editor on "Public Shelter Living: The Story of Shelter 104"? Was Dorothy McManus the original Emmy, the model for television's top award? Did anyone ever respond to the a question about the film, "Invasion of Poland," asks researcher Jeff Grehan. See if you can answer any of the questions on the Help page. Alumni of Signal Corps Photographic Center / Army Pictorial Center have been asked to donate artifacts to the collection at the Museum of the Moving Image. Collection Curator Barbara Miller wrote, "We would be very interested in collecting 'artifacts' from former SCPC/APC staff. These would include cameras (not necessary that they be in working condition) and other technical equipment, photographs, scrapbooks, manuals, or any other objects used in the production or promotion of media created by the military. We have a fairly significant group of objects related to the APC in our collection, and are committed to preserving APC history through collecting and exhibiting this material. Please note we do not collect moving image media (i.e. film and video), only objects related to their production, promotion, and exhibition." If you have artifacts you can offer to the museum, send a note to this site's Webmaster.